Whales, Seals And Horses – Or What Is An Atrocity Anyway? Please allow me to interrupt the flow of jello salads and other monstrosities to reflect on some more serious aspects of the concept of culinary atrocities and food taboos. 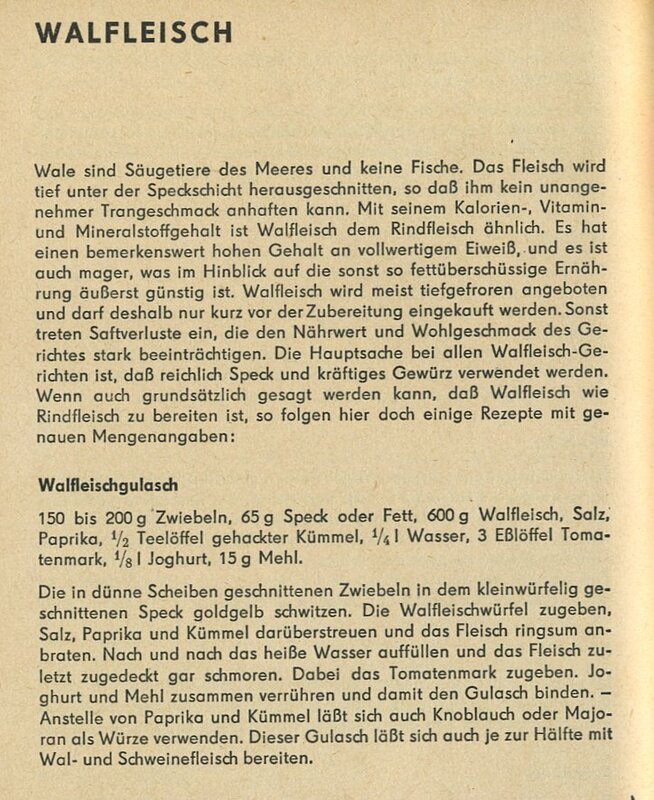 This does look rather weird in a German cookbook. Our country is not particularly well known for its love to whale meat. But probably East Germany had a contingent of Soviet whale meat in the final days of global whale hunting. 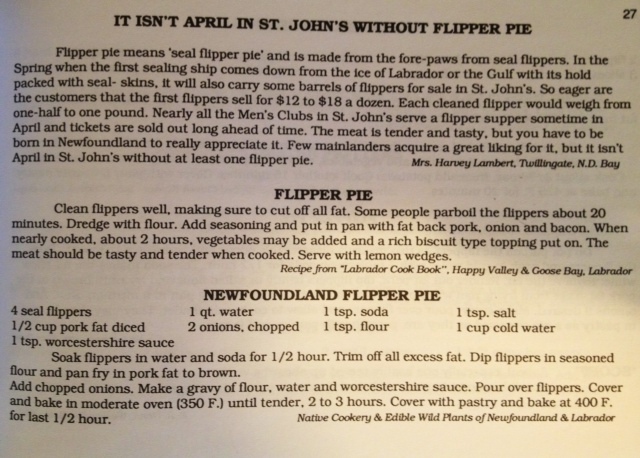 On a related note Canadian whisky blogger Graham McKenney sent me a picture of a recipe for “Flipper Pie” made from seal meat. Of course this immediately makes us think of the shocking pictures of blood-covered bodies from the annual seal hunting season in Northeast Canada. The two are a bit different, though. Whales had been hunted until they were nearly extinct. The near global ban on whale meat (hello Japan…) was lile pulling the emergency break on a train. This has led to whale meat becoming a taboo in most countries, and even if populations would become large enough for sustainable hunting again, it is highly doubtful if whale meat would ever be a popular staple other than in tradtional whale hunting countries. When herring populations go down, temporary fishing bans are in place. Then the killing continues. Nobody will offer “herring watching” tours for diving tourists like it is done for whales or dolphins. A herring is just a small fish after all. But is it less worthy than a whale? While some seal species have shared the fate of whales, the harp seals hunted in Canada are not endangered. It’s the bloody business of their killing that has made seal meat just as much a taboo. Seals are slaughtered on open ice, the pictures went around the world and turned many stomachs. Slaughtering of cows and pigs happens behind the wall of abbatoirs, so we cannot see it, but it is slaughtering nontheless, and it is industrialized. And many consumers who cry out because of the cruelty of foie gras production don’t give a damn if the chickens and turkeys they eat have spent their short lives in concentration camps. Here we encounter the widespread doublethink in food, meat in particular. Currently the horsemeat scandal is rocking Europe. Apart from the fact that there is a lot of criminal energy involved in sneaking undeclared meat into the ridiculously twisted industrial food chain, it also highlights the status of horsemeat as a taboo food in many countries, especially in anglo-saxon ones. But is a cow less worthy than a horse? In many non-western regions of the world, people happily eat maggots, crickets, cockroaches and other “disgusting” animals. We eat shrimps, lobsters and oysters that look pretty yucky to the uninitiated too. The concept of a culinary atrocity is as flexible as a slice of processd cheese and as wobbly as a blob of jello; a mix of personal taste, cultural background and true grue. What to make of all this… Turn vegan? Then we’d have to get rid of woollen jumpers, leather shoes, natural hair brushes and other animal products as well beacuse they all are based on the exploitation of animals. Which leads us to the question if an apple is less worthy than a chicken? Humans seem to be struggling with the fact that they are a part of nature and not outside of it. But we are the one species capable of respect for all of nature because otherwise our dominance could eventually endanger ourselves.